Using ProposalPad you can respond to new business opportunities with greater efficiency, higher productivity, and the consistent quality proposals and presentations you desire. ProposalPad is a unique online proposal system developed for small business owners that makes it easy to create professional quality project proposals. Why pay for a proposal template when this PDF proposal service allows you to quickly and easily develop your own personalized proposals? Just upload your company information, services, and logo once, and you're ready to start creating proposals that will put you ahead of the competition. Create custom stationary for your proposal pages for a totally custom look. Use the widget above to review or approve your proposal if your vendor has a Pro account. You can even sign the proposal securely online! 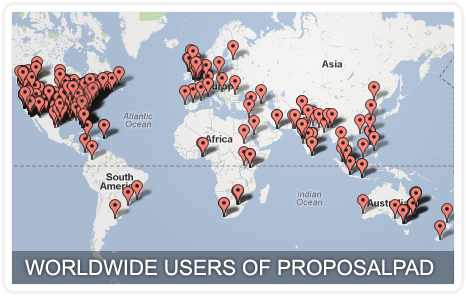 ProposalPad allows business proposals to be created quickly and easily and be available anywhere. Our PDF proposal solution makes the tedious task of typing our proposals a thing of the past. Try our business proposal software for free with a basic account. Pro accounts are cheaper than a cup of coffee a week and can save you countless hour of messing with proposal formatting and make you look great.